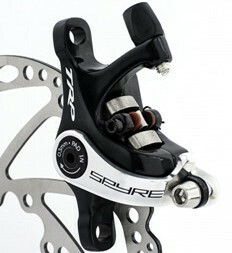 Disc brakes were revolutionary when they first appeared on mountain bikes, and are now popular on road bikes too. However, poorly aligned disc brakes can easily ruin the feel & performance of your bike. Here’s how to get it right. If you’ve ever suffered a rubbing disc brake, you’ll know how annoying it can be. That slight kiss from the disc onto your brake pads and the accompanying squealing/scraping noise can drive you mad. In severe cases you’ll be fighting every pedal stroke as your brakes slow you down, and your pads will wear out quickly and unevenly. The procedure for correctly aligning your disc brakes depends on which type you have. 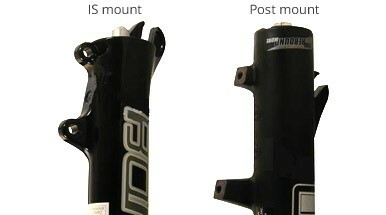 Note: This guide only covers flat-mount and post-mount style disc brake calipers. Older IS mount calipers are aligned by using washer spacers of different thicknesses and flat-facing the eyelets with special tools. IS mounts are difficult and time-consuming to align perfectly. We recommend seeking the advice of a professional mechanic with access to advanced tools to align IS mount calipers. Cable disc brakes are less tricky to align and maintain than hydraulic disc brakes. However, they require almost constant maintenance to keep them operating at their best. Don't be daunted by the number of steps involved when aligning your cable disc brakes. It's a very methodical process, and is far less frustrating for novice mechanics than hydraulic disc brakes. Unlike hydraulic disc brakes, mechanical disc brakes are not self-aligning so will need periodic adjustment of the brake pads and cable tension to compensate for wear. Pull the brake cable through the arm lightly, then clamp it back down. Wind out the cable barrel adjuster until the bite point on the brake lever feels comfortable. Once set up, hydraulic disc brakes are self-centering, meaning you don’t need to make periodic adjustments to the pads. When you pull the brake lever, the fluid will pump from the master cylinder into the brake caliper, pushing the pistons in towards the rotor. If the brake pads are slightly off-centre, the one which makes contact with the rotor first will be stopped in place, while the other effectively catches up. With both pads now firmly against the rotor, when the brake lever is released both pistons/pads will release from the rotor simultaneously. Initially, however, the caliper still needs to be correctly aligned to ensure the pads contact the disc brake evenly, without any rub. 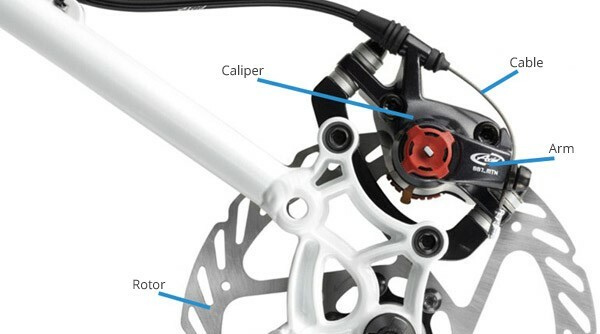 A common “trick” to aligning a hydraulic brake caliper is to slacken the mounting bolts slightly, pull the brake lever hard while the caliper is free to move, then tightening the bolts back up while the brake pads are firm against the rotor. This method is highly unreliable and rarely results in accurate alignment. With a little bit of patience without taking any shortcuts, aligning your brake callipers is a job you will only have to do once. If you have any questions about aligning your disc brakes, you can call us on 01792 583 000 or feel free to use our Live Help service at the top of the page.